Do you like to soar through the sky with your cape flapping? I do! Snack Girl has a cape and she jumps from her bed often to feel the rush - as she screams "Snack Girl to the RESCUE!!!" If I WAS a super hero, I would drink POM Wonderful. Check out that bottle! It belongs on the space shuttle, and it will be going to Mars some time soon. Right about now, I have to do a disclosure. I have a good friend who worked directly for Linda Resnick, creator of POM Wonderful, and (in my opinion) she ain't so wonderful so I am inclined to HATE this drink. But, I am a professional snack reviewer so I will put my animosity aside. BUT, not before, I point out that Ms. Resnick has authored a book (see below) entitled, "Rubies in the Orchard: The POM Queen's Secrets to Marketing Just About Anything". She calls herself a Queen (a teeny weeny bit crazy, no?). This does COLOR how we see her product. Is this just a marketing blitz (and one to be admired)? or is this stuff really a drink that will end all your problems? 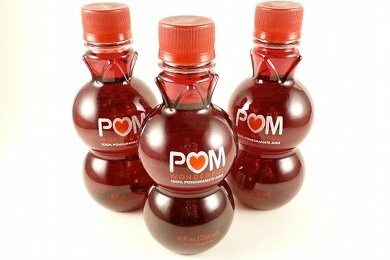 POM Wonderful is pomegranate juice. It has more sugar per serving than soda (like other juices) and is much better for you than Minute Maid Juice. It is 100% juice, which is a good thing. It tastes much like cranberry juice and I found it to taste better when mixed with other juice or Sparkling Water. So, you can drink POM Wonderful and get a concentrated amount of polyphenols (with all the sugar) or you can just eat pomegranate seeds, blueberries, grapes, vegetables, drink coffee, red wine, etc. It costs about $3 for an 8 ounce bottle - which is a lot when you consider what 100% apple juice costs for 8 ounces (around a $1). But, apple juice has less polyphenols - maybe apple cider has more (more peel involved). Anyway, I made a drink with the juice I received from POM (they sent me a whole case). I liked it mixed with sparkling wine and orange juice. Today IS Friday, so I thought I would share a special weekend treat. I have included a link to a champagne stopper. It is really easy to just have one glass of sparkling wine and save the bottle for another time. It is simple to use - and some of my friends didn't know about them so I thought I would share. You DO NOT have to drink the entire bottle after you open it. My conclusion: POM is a nice treat. It is too expensive for me to buy on a weekly basis, so I will save it for special occasions. In a champagne glass, pour 1/2 glass sparkling wine and 1/2 orange juice. Add 2 tablespoons of POM Wonderful for color and flavor. Adjust to your taste. What do you think of POM Wonderful?" Since you're not a fan of the creator (and I'm not a fan of the product - far too many calories), how 'bout this as an alternative? I purchase Protein.2go (Pomegranate) and pour the powder into a 52-ounce bottle of water. It's got 10 grams of protein, 1 gram of sugar, and only 50 calories. You purchase it in a box of 10. It costs about $1.40 per package. So, it's a lot cheaper, packs in some good protein and the calorie count is insignificant. Regardless of what you may think about the product, I am a little turned off by your commentary on the creator. If you really are a "professional snack reviewer" then stick to what you research and write about. The other stuff has no business being reviewed. I wonder about the price, too... I buy an imported product from Turkey for $2 a liter. POM is not even organic, either. Pomegranate juice does have a lot of sugar, as all juices do. I mix it in with Red Zinger tea - about 5 to 1 ratio (tea to juice). Terrific! In regards to the sugar content of POM Wonderful 100% Pomegranate Juice, we'd just like people to know that our juice is all-natural and does not contain any preservatives, added sugar, or artificial sweeteners. We are dedicated to providing you with the world’s best pomegranates, juice and tea. We exclusively grow the Wonderful variety in our own orchards in the San Joaquin Valley, which is located in central California. We harvest each piece of fruit by hand and press the goodness from the fruit to make our juice.